Thank you IZ. The power of your voice, humanity, and music will never leave us. 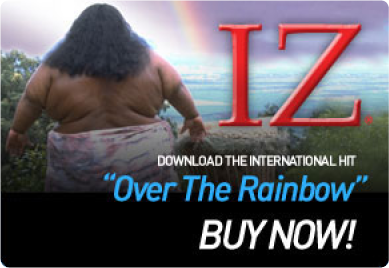 Today a friend of mine sent me a link and it was the remarkable and brilliant IZ! I am so happy to have found this treasure with an angelic voice. I am a fan now forever. I love the great IZ and his music makes me so happy. The first time I heard ‘Somewhere Over the Rainbow’ with his voice, it brought me to tears. Tears of joy. I hope everyone has the chance to hear you and enjoy your music as well. Joy always. I am speechless. I just asked my daughter what the name of your song that she played in her wedding and I found out that you are one of God’s Angels now. You had a Beautiful voice here on Earth and I can only imagine what you sound like in Heaven. He is one of my favorite singers and transports me back to my best memories of Hawaii at the times I cannot be there. I only found IZ a few years ago but have relished the music ever since. It brings to me the essence of my home place (Manoa Valley) and brings back great memories of the islands. I am now on the mainland, about as far away as is possible (East Coast) and long to be home again. Every time I hear his music, and see his videos, I tear up, knowing a great man and a great voice is no longer with us. I wish I could have seen him live. I have been drawn to this music today.I had to learn to play”over the rainbow”both on ukelele and guitar and listen to it over and over again.I had no idea of the significance of the date.Love lives forever. DIOS LO TENGA EN SU GLORIA, SIENTO NO HABERLO ESCUCHADO EN VIVO. SUS CANCIONES ESTARAN PRESENTES EN MI, AMEN. I was very fortunate to be part of Los Angeles “Ukule-along” July 14,2012 where I was the only left handed Uku player there out of 400 plus players. I was given the “IZ” arrangement…………..I now play it every day. What a inspiration Mr. IZ was and is!………………Thank you! You had the voice of an angel and your music moved me to tears. Remember so well his beautiful voice. I am listening to him right now. I just told my husband that he is most certainly in God’s choir. Thanks for your music, your touching songs. we really miss you big boy. One time i heared his music i feel In love i need to know everything about his life. I just wanted to stop by here and the whole world know how much I love IZ’s music. I first herd about IZ 2005 when I first visited Hawaii. Ironically, upon my arivel in Oahu, the song that was playing while traviling to the hotel was ” over the rainbow” and I loved the voice right way. Sinve then I came back to Hawaii many times, but was in 2010 when watching a parade in Waikiki, that i leaned more about the man IZ Kamakawiwo’ole. Ever since I learned more about him, I became a fan, and to this day, I am in love with the Hawaiian music, culture, and its people. I have almost all his CD’s and I am planning to buy them all. I became a hawaiian in my heart thanks to IZ and his beautiful music. I am now trying to play Ukulele, and I am also tryingto learn Hawaiian language. Thanks IZ, even though we have never met, bu through your music is like we have. I just heard IZ for the first time. We were in Hawaii, rented condo, there were CD’s of IZ. I have never experience this voice, so angelic, so deeply filled with love. I can’t get enough of this mellow, mature, young man. But this man, Iz Kamakawiwo’ole, will stay always with us with her wonderfull voice. Hello valerie from little rock arkansas, I used to play IZ’s song somewhere over the rainbow to my son when be was in my belly , now when he needs something to help him stop crying and sleep , I can play this song it works like a charm every time . He is 5 months old now , WE LOVE YOU IZ!!! To IZ, May God Bless You anh hold you close in Heaven. Thank you for the beautiful music! I hope you and my son Matthew have met, Matt would really like you. To IZ’s parents, I am very sorry for your great loss of IZ, please know that his beautiful music gives me some peace and comfort. I am praying that IZ and Matt have met in Heaven and are watching over us. Thank You for sharing IZ’s music. God Bless You! Prayers for you. I will always remember him for his song & the video for Over the rainbow with the video of his ashes flowing freely in the water with all of his friends in the water and boats all around for his funnel. He had a wonderful voice and I’m sure he will be missed by many for a long time to come. I listened to you’re song, over the rainbow years ago and like so many fell in love with it. What I wasn’t aware of at the time was that you had already left this realm. I would most certainly have loved the opportunity to tell you myself how inspiring you’re song was to me at a ti me when I needed a bit of a boost. Thank you for spreading joy, even if you may not have been aware of it at the time. It would’ve been an honor. Today hearing IZ’s song, on “50 Dates♡” Movie, I took the time to see who it was, that sings the wonderful version of ‘Over the Rainbow’, that I love♡ so much, only to discover IZ is only a memory—but, aaaaah, what a memory. Rest In Peace IZ. I have posted IZ’s song on my website (witch I did post it before learning of his death, how very sad to have learned the singer was dead!! But, he lives on in his music & memories of those alive.). Mauro♡, my husband likes it too. Iz I feel a connection to you that is very spiritual. There have been many coincidences when I can be enjoying a sunset or watching nature and your songs will come on the radio. In this way I feel you speak to me and all your fans around the world. I had never seen you in concert but only know you through the rich legacy of the music you left behind. There u live on and someday I hope we meet over the rainbow. Until then Mahalo and Aloha! I just found IZ love his music. Can any one tell me where I can get a cd of his.